As we all hunker down and await the peak of winter, now is the perfect time to start daydreaming of Springtime Glamping! Naturally, Laura and I initially think big. Grand Canyon? Yellowstone? Badlands? So many choices! 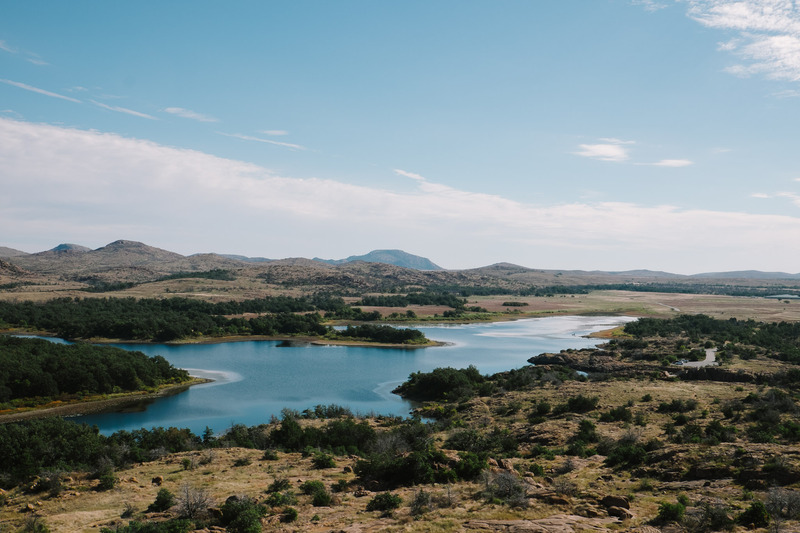 But for us, our go-to first camp of the season is our local favorite, the Wichita Mountain National Wildlife Refuge. Regardless of what high-profile trips are eventually included in your summertime glamping plans, it’s always wise to plan a “shakedown” trip for your first camp of the season–somewhere easy, uncomplicated, and perhaps most importantly, close. A shakedown trip gives you the chance to warm up to camping again, but perhaps most importantly lets you identify any issues that may have popped up after winter storage. (See our “Accidental Boondocking” post to see what happens if you don’t maintain your battery over the winter! Oops.) For Laura and I, the Wichita Mountain NWR is the perfect shakedown spot. It’s close, simple, and is a guaranteed hit for the kids. Wide view of Quanah Parker Lake at the Wichita Mountain NWR. Deep in the heart of Southwest Oklahoma, the WMNWR surrounds the remains of an ancient (and formerly gigantic) mountain range. 500 million years of erosion have reduced the range to a small cluster of “mountains,” the tallest of which being 2,400-foot Mt Scott (visitors can drive to the summit via a well-maintained, paved road). 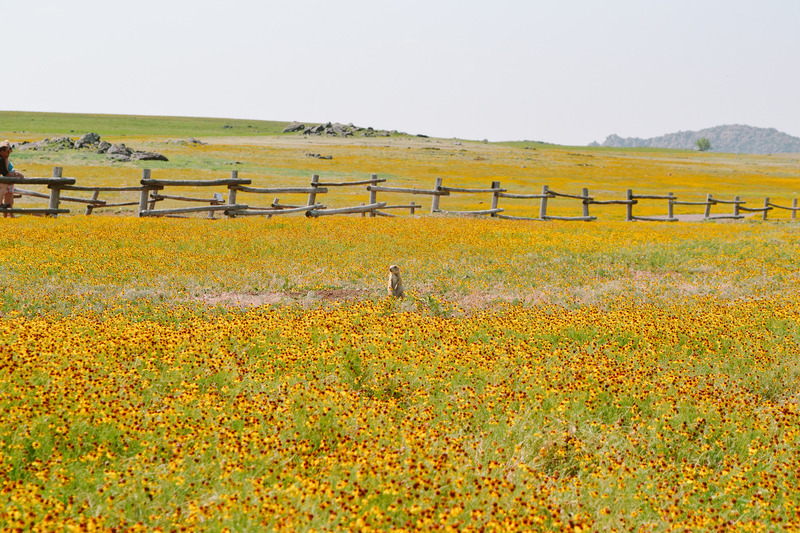 The refuge is also home to free-range bison, longhorn cattle, elk, prairie dogs, deer, and foul. Camping sites are plentiful, although electrical sites are limited (the sites don’t have individual water hookups… so that’ll require a little extra planning). 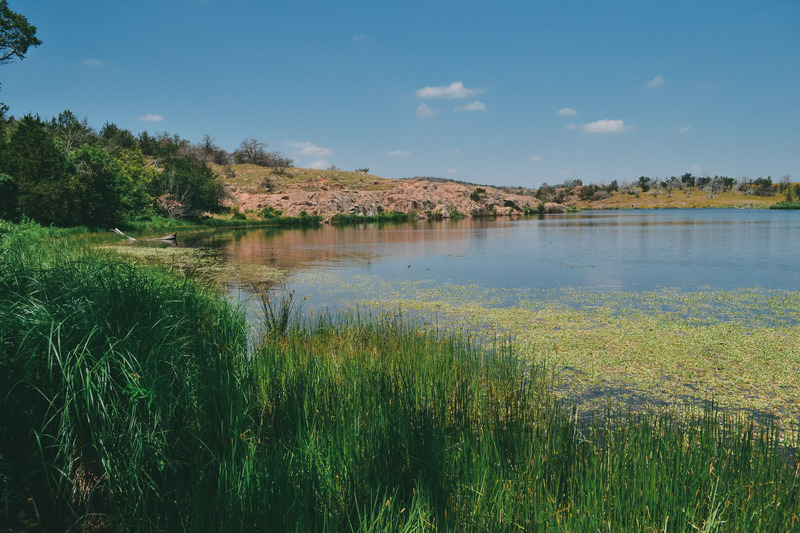 Some of the camp sites have private access to Quanah Parker Lake, which is crucial for camping in the heat of summer. Unfortunately, the Refuge doesn’t take any sort of reservations… so arrive early, and have a backup plan! The Refuge also boasts about a dozen public-use lakes available for fishing. Quanah Parker Lake is a lovely spot, and is easily accessible for kids. We’ve never actually… you know… caught anything; but we hear that there are large mouth bass, crappie, and catfish aplenty! What’s the fun of fishing with kids if you actually catch something, amIright?! There are plenty of kid-friendly fishing spots… even if the fish are Jimmy Hoffa-esque in their elusiveness. There are also about a dozen hiking options, most of them kid-friendly. We’re particularly fond of the Little Mount Baldy hike (the trailhead for which is accessible from the back of the Camp Doris site). It provides a light-to-moderate trail which terminates at a visually pleasing vista. Our pre-K age kid could tackle it without much assistance (with a few snack breaks, of course). There’s also a short “beaver dam” trail within the Refuge… another favorite of our daughters. Finally, the Refuge also maintains a top-notch Visitors Center. Recently renovated, the center is clean, comfortable, and informative. Appropriate for both kids and adults, you’ll definitely walk away having learned something. Science! If you get sick of camp food (if you are, you’re probably Glamping wrong! ), you can always take a short drive to Meer’s Store and Restauraunt, a Southwest Oklahoma legend. The waits can be long (for the love of all things holy, avoid the Sunday “post-church” crowd) and you must pay in cash, but it’s worth a trip, especially if you’re from out the area. Bring an appreciation for this middle-of-nowhere landmark, and certainly bring your appetite. The “large” burger is the size of a small plate… and if you don’t save room for the homemade peach cobbler and ice cream, you’ll never forgive yourself! One additional note: Please remember that this is Southwest Oklahoma. As with any camp experience (but especially in the Southwest), keep an eye out for the less-than-friendly wildlife. 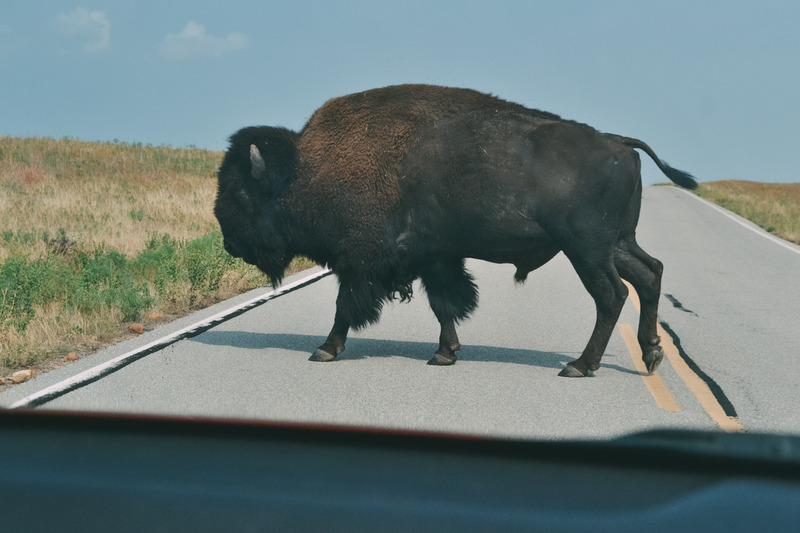 While the buffalo and longhorns are generally friendly, they’re still wild, and it’s best to appreciate their majesty from a distance. Also keep in mind that as a refuge, it’s worth keeping a lookout for the occasional coyote, scorpion, tarantula, and tick. We got to witness a tarantula migration once at this park once (yes, that is a real thing!). They were generally harmless, of course… and the girls thought it was fascinating. Laura was… less than enthusiastic. Laura and I look forward to visiting the refuge again for our upcoming “Shakedown cruise.” Here’s to hoping I winterized right! If not, who’s down for another boondock? What’s your shakedown cruise go-to spot? We’d love to hear your story below! In the meantime, glampers, hunker down, sip that hot chocolate, and dream of springtime camping adventures! We love the wildlife park too. I can’t wait for the hummingbirds to come back. Awesome article and pictures to capture the beauty. This is our favorite part about living in Oklahoma. Melissa! Thanks! We also can’t wait for spring to return to SWOK. We’re hoping the long (dry) winter won’t clobber wildflower season this year. Only time will tell!